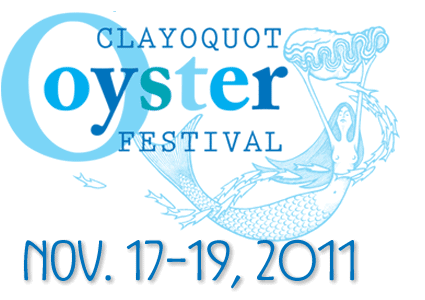 This year we celebrate the 15th Annual Clayoquot Festival of Oysters and the Sea!! What was once a humble locals event for one night; something do to on a rainy night in our once sleepy November town, has now evolved into a weekend of oyster gastronomy, including oyster farm tours, educational seminars, masquerade ball and of course, the main event, selling out in just four hours after tickets went on sale this year, the Oyster Gala. Always one of the most memorable nights of the year the oyster gala aims to fulfill all your oyster desires. Local restaurants will showcase their inspired oyster dish for all to indulge. One of Vancouver’s best and busiest live acts ‘Brickhouse’ will be on hand to play some happy, funky, bluesy tunes that will have both young and young at heart humming along and dancing up a storm. Some of bc’s great wines and beers will also be there to help set the festive mood. For those thirsty for competition there will be a chef/farmers oyster shucking relay, demonstrating Clayoquot Sound’s love of opening and eating our magnificent oysters. The Tofino Oyster Festival is celebrating its 15th anniversary in November 2011. The festival includes oyster farm tours, educational seminars, the Mermaid's Ball, and of course the ever popular Oyster Gala.